A good friend of mine who is a true believer has informed me that he gets his global warming science from Dr Karl who has an ABC radio program and who also writes articles for the ABC . Giving the doctor his due he answers questions on many scientific questions well and it seems that only when he gets into the global warming area that science goes out the window and is replaced by the global warming catechism. His latest foray on the subject should be titled Dr Karl's Great Moments in Nonsense it is so bad. In it he joins the warmist world in it's desperate attempts to keep their failed theory alive after nearly 20 years of no warming. He accuses skeptics talking about the "global warming pause" of cherry picking facts. He then does some extraordinary cherry picking himself. Claim 1: Two bodies, the Royal Society and the US National Academy of Sciences, warned that "climate change is more certain than ever." There are four major global temperature data sets all showing Dr Karl has got it wrong. 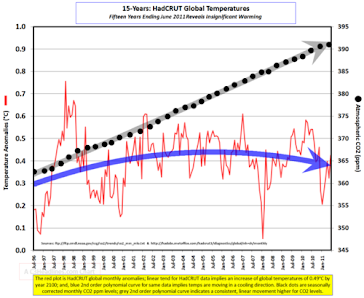 The most accurate record is the RSS satellite data showing 18 years of no warming and even the massively tampered GISS record shows a 10 year flat record. There are other indicators that inform us about the state of the global climate. They include the volume of the Arctic sea ice (which has been shrinking), snow in the Northern Hemisphere (also shrinking) and glaciers (more shrinking). 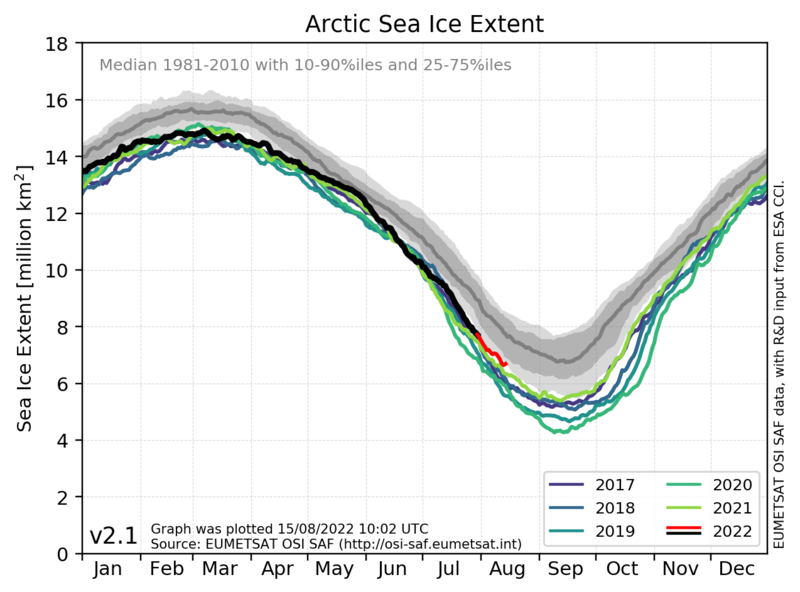 Arctic ice records from satellites only go back to 1979 when it was at a high level due to global cooling and it is true that Arctic ice has been cyclically shrinking since then. Dr Karl neglects to mention there was a lot less ice in the seventies than now. He also neglects to mention the huge recovery of Arctic ice this year increasing a whopping 64% from 2012. He also does not mention the all-time record high for Antarctic sea ice this year. 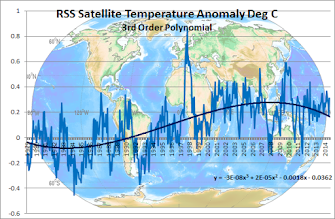 Records from NOAA show 1979 start date distorts graphs. Northern Hemisphere snow cover seems not to be shrinking. And if you are a skier you would love this last decade looking at NH winter snow increasing at a great rate. 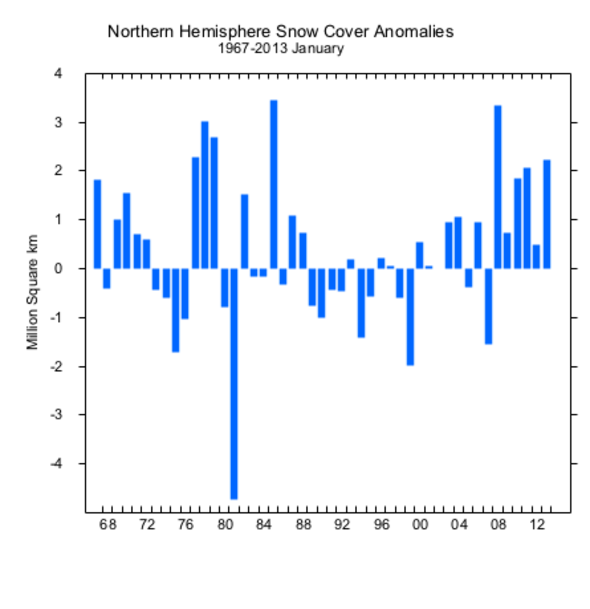 In the oceans we measure the sea level (which has been rising as an accelerating rate). 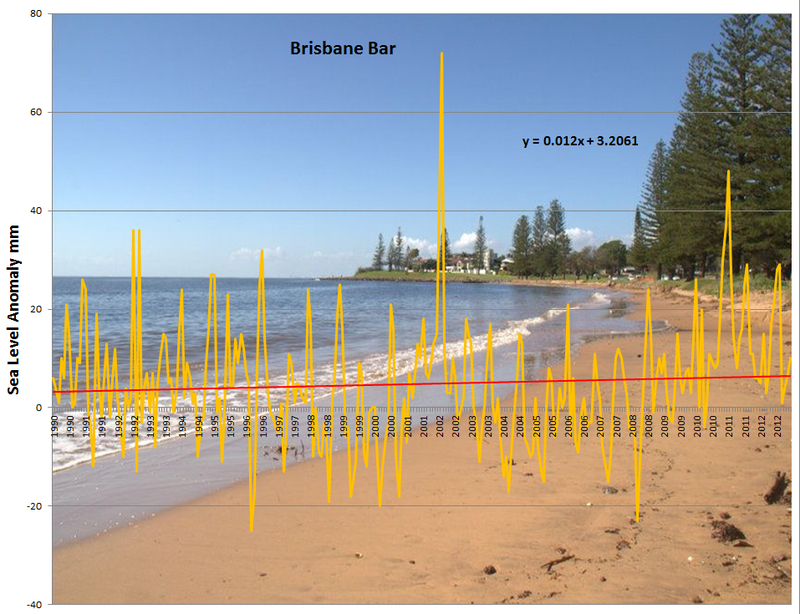 We can simply check our own Brisbane Bar tide gauge showing very little sea level rise. - Sea level is measured both by tide gauges and, since 1992, by satellite altimetry. One of the keepers of the satellite record told Professor Mörner that the record had been interfered with to show sea level rising, because the raw data from the satellites showed no increase in global sea level at all. - The raw data from the TOPEX/POSEIDON sea-level satellites, which operated from 1993-2000, shows a slight uptrend in sea level. However, after exclusion of the distorting effects of the Great El Niño Southern Oscillation of 1997/1998, a naturally-occurring event, the sea-level trend is zero. - The GRACE gravitational-anomaly satellites are able to measure ocean mass, from which sea-level change can be directly calculated. The GRACE data show that sea level fell slightly from 2002-2007. - These two distinct satellite systems, using very different measurement methods, produced raw data reaching identical conclusions: sea level is barely rising, if at all. - Sea level is not rising at all in the Maldives, the Laccadives, Tuvalu, India, Bangladesh, French Guyana, Venice, Cuxhaven, Korsør, Saint Paul Island, Qatar, etc. - In the Maldives, a group of Australian environmental scientists uprooted a 50-year-old tree by the shoreline, aiming to conceal the fact that its location indicated that sea level had not been rising. This is a further indication of political tampering with scientific evidence about sea level. - Modelling is not a suitable method of determining global sea-level changes, since a proper evaluation depends upon detailed research in multiple locations with widely-differing characteristics. The true facts are to be found in nature itself. - Since sea level is not rising, the chief ground of concern at the potential effects of anthropogenic “global warming” – that millions of shore-dwellers the world over may be displaced as the oceans expand – is baseless. - We are facing a very grave, unethical “sea-level-gate”. If you need to check Dr Axel-Morner's qualifications on sea levels against Dr Karl's read on. Dr. Nils-Axel Mörner has worked with sea level problems for 40 years in areas scattered all over the globe. As head of the unit of Paleogeophysics & Geodynamics at Stockholm University, he worked with many different geological-geophysical problems. He organized two major international conferences; one on “Earth Rheology, Isostasy and Eustasy” in 1977, and one on “Climatic Changes on a Yearly to Millennial Basis” in 1983. He has run several international field excursions through Sweden. He was President of the INQUA Commission on Neotectonics (1981-1989) and President of the INQUA Commission on Sea Level Changes and Coastal Evolution (1999-2003). He headed the INTAS Project on Geomagnetism and Climate (1997- 2003). In 2000, he launched an international sea level research project in the Maldives. In summary it would seem that the good Doctor Karl has been doing some cherry-picking himself !